In Houston, Thousands Remain Displaced As Harvey Recovery Continues Thousands of residents are still living in hotels and rental housing while they await insurance money to help them rebuild homes that were flooded in Hurricane Harvey this summer. Recovery efforts are ongoing in Houston from nearly $200 billion worth of damage caused by Hurricane Harvey in late August. More than 100,000 homes were damaged in historic flooding, and thousands of residents are still living in hotels and rental housing while they wait for insurance checks. Alma Roberts, who told Here & Now's Meghna Chakrabarti in October that her home of 14 years flooded for the third time in the storm, says she and her family are still renting an Airbnb. Nearly 11,300 families were still living in hotel rooms funded by the Federal Emergency Management Agency as of Dec. 15, according to The Texas Tribune. Roberts says they plan to rebuild and expected the estimated six- to nine-month rebuilding process to begin soon. She tells Here & Now's Jeremy Hobson that she is concerned about the city's infrastructure overall. "I'm concerned about what's the city doing. What's going to happen the next time we have really bad weather and if it rains a lot?" Roberts says. Even though Roberts had flood insurance, she says her family will still have to borrow some money to cover the cost of rebuilding. 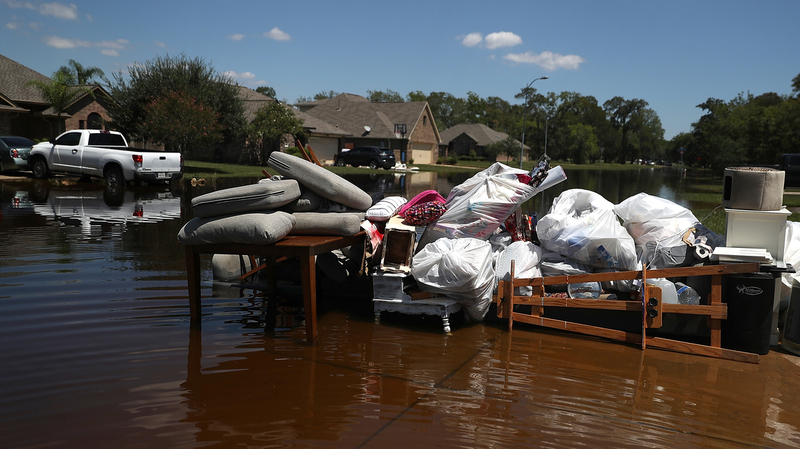 Nearly four out of five homes damaged in Harvey's flooding were not covered by flood insurance, according to the Consumer Federation of America. Houston's chief recovery officer, Marvin Odum, the former head of Shell Oil Co. who helped the company recover in New Orleans after Hurricane Katrina, told Marketplace this week that Houston is essentially two cities right now: the part that was open for business two weeks after the storm and the areas that are still struggling to recover. "The danger is that what gets lost in that picture are the vast number of people and pockets and neighborhoods that have been severely impacted by the storm," he says. "And that's where we need to maintain the focus of this recovery and that's where we need to maintain a certain amount of public awareness as well so that we recognize there's still a tremendous amount to be done." Earlier this month, Houston Mayor Sylvester Turner made a desperate plea for Congress to approve $61 billion in federal disaster assistance. So far, the state has received $11 billion in federal aid, which is significantly less than the $115 billion allocated after Hurricane Katrina and the $56 billion after Hurricane Sandy. "Literally, there are thousands of people living in homes that need to be remediated," Turner said. "And there are thousands of people who are still living in hotels. And the question is, where do they go when FEMA says, 'No more'?" Before the holiday break, the House passed an $81 billion disaster relief bill for Texas, Florida, California and Puerto Rico, but the Senate is not expected to consider the bill until next year. Odum says federal money is needed to prepare the city for future disasters. "To do the same thing we've done before — which is just repair structures, put people back in their homes and basically sit there and wait for the next flood when it starts all over again — is absolutely untenable," he told NPR in an interview this month. "Allocating the money now for the flood mitigation activities so that you can make these neighborhoods resilient, prevent the floodwaters from coming into the houses and then not have to pay for this kind of repair three years down the road makes perfect sense." Roberts says her family expects to spend an estimated $24,000 in rent while they wait for their home to be rebuilt. While they could find a cheaper option than Airbnb, Roberts says her family of five needs the amenities offered because they lost everything. "Even if we found a place that was less expensive, we don't have trash cans. We don't have anything," she says. "And this place did come with a bunch of fresh clean towels, blankets, sheets, you know, things that you take for granted. So for us to go and spend more time right now just didn't make sense, especially when we're trying to really count our pennies now to rebuild."